Seeing as Image seem to have misplaced The Walking Dead #71 somewhere (let us know when you find it please – it has a very good cover featuring lots of children playing happily, and one kid who doesn’t look so happy) I have been brave enough to see what else this ‘comic publisher’ offers. A couple of years back I would have happily took a punt on most anything Image produced. Nowadays I feel a bit more jaded about the state of comic book publishing (have you seen the shipping schedules recently? Wolverine titles galore, Deadpool overload, Lockjaw & The Pet Avengers…NO WALKING DEAD!!! )and it takes something extra special to coax me to pick up something new. 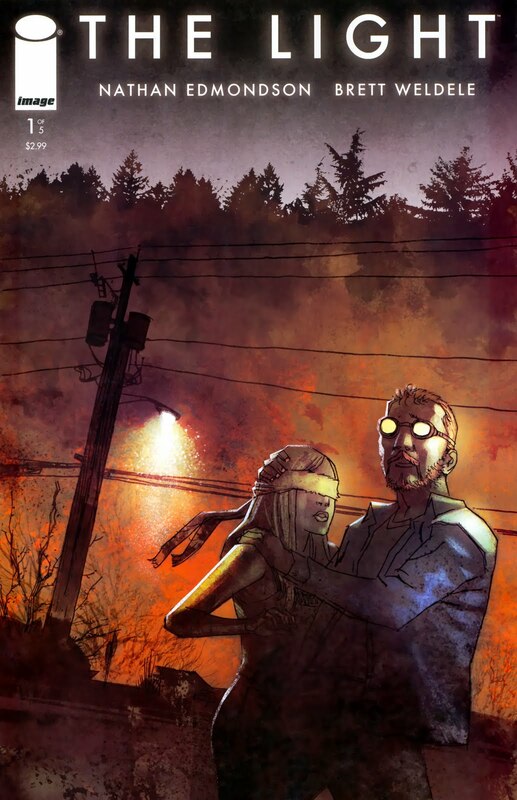 But this new title, with it’s Ben Templesmith-esque art, and its stark title, tempted me. I am glad it did. I needed some comic apocalypse, and The Light delivered. We quickly establish that the protagonist (in this issue at least) is a ne’er-do-well, a failed Husband, Father and Welder, disliked and disappointing in his middle age. An undeserving hero, who by luck and fortune manages to avoid a calamity that is never fully explained, but whose effects are catastrophic. The guy just about manages to keep it together to try and do the right thing by his teenage Daughter, until…..
Read the thing – it’s brilliant. Economic with its plotting, it does take Ben Templesmith’s art as an inspiration, and that is fine with me, as the art is lovely in its embrace of death and a rapturous end. A great debut. Cheers Image. You took my mind off Walking Dead #71 for 15 minutes.